Get ready to experience the amazing tour to Golden Triangle with Udaipur starting from Delhi. The tour will be a perfect treat to your family and enjoying the quality holidays together. The tour starts with exploring the capital city of Delhi. You will visit Unesco World heritage sites and symbols of Indian rich heritage. Moving to City of Taj Mahal, Agra the tour will get into the amazing turn where you will visit the wonder of world and symbol of Love The Taj Mahal. Taking a step further you will visit Ghost city of Fatehpur Sikri and the paradise for birds Bharatpur National Park. Pink city of Jaipur will give you a warm welcome and a gracious greet. You will lost yourself in the simplicity and uniqueness of Jaipur. Finally the tour will head to City of Lakes-Udaipur. You will certainly get amazed and thrilled by the beauty of the Udaipur. On arrival at Delhi International Airport our representative will assist you to transfer and check in at the hotel. Relax for the day, in the evening after freshen up proceeds to experience the life of Delites and youthfulness at centeral Delhi area. 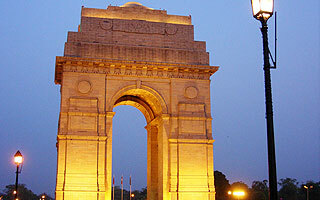 As you will visit India Gate you can feel the chivalary and sacrifice in the air. The scene around the India gate area is so live and happening that you can’t stop yourself engaging with it. Start your sightseeing tour with drive pass to Red Fort, the monument has been a symbol of India’s revolution for freedom and changing era after Independence. After red fort make a visit to Raj Ghat the Samadhi of Father if Nation-Mahatma Ghandhi. After Raj ghat visit proceeds to Humayun’s Tomb which is memorial of Mughal Emperor Humayu and is also a UNESCO World Heritage site. Next attraction would be Qutub Minar, built by Qutub Din Aibak the monument has been the symbol of Delhi from the long time. The monument complex is so unique that it will take you to the ride of bygone era. After Qutub Minar you will explore Lotus Temple, a place where whole world and all religions becomes one. People of all the sects visits the place with great inner devotion to strengthen the world peace. Evening explore the local markets of Delhi. After breakfast and check out from the hotel start your drive to Agra. Agra city is like a dreamland holding the dream monument of Taj Mahal. Agra city is well connected with newly build Agra Express Highway which has shortens the distance and time to visit the monument city from Delhi. Enroute you will visit Tomb of Akbar at Sikandra the visit will be different in itself as the atmosphere around the monument is so peaceful that you will feel to stay at the place for a long. On arrival Agra check into the hotel.. After freshen up proceeds to visit symbol of Love “The Taj Mahal”. Taj Mahl has been one of the most visited monument of the world. Once you will find the first glimpse of the Taj you will realize why it is so famous and most amazing specimen of art that man has made. The beauty and masterpiece architecture is beyond the explanations. If time premise you can also visit Agra fort and Itmad-Ud-Daula’s Tomb. After sightseeing and monuments visit proceeds to explore local market and shops of Agra. Agra is famous for leather items. Morning after breakfast and chec out drive to Jaipur. Enroute explore the city of Fatehpur Sikri. The city once been the residence of great king Akbar but now has been only relics and monuments reflecting the royalty of past. Buland Darwaja is the most spectacular attraction to explore in Fatehpur sikri. After visit continue your drive to Jaipur visiting Keoladev Ghana National Park enoute. The park is paradise for bird watcher. There are regular rickshaw ride available to explore the birds in the park. After visit start your drive to Pink city –Jaipur. On arrival check into the hotel. Morning after breakfast proceeds to visit great master monument of architecture Amer Fort. You would have the option to go on Jeep or Elephant ride to the fort from Parking. The fort is a city in itself. You will amazed by the work of art and mastery of architecture that reflects from the every corner and construction of the fort. After fort visit return back to city and make a drive pass to Hawa Mahal or Wind Palace. The spectacular palace with having 152 windows and 5 stories has been the prime point of attraction in Jaipur. Later visit Janatar Mantar an observatory which is still in operation today and the Sun Dial still shows accurate time on different phases of day. City Palace is the other main monument which will pulls your notice and make you feel and experience the grandeur of the princely era. Along with you can also visit Albert Mueum which has reservoir of some of the very rare historical artefacts and things. Evening enjoy Rickshaw ride at exploring the local markets of Jaipur. You can also visit Chowki Dhani which would add on extra charm in your tour for sure. You will get an opportunity to taste and experience Rajasthani food, cuisine and culture here. After sumptuous breakfast a smooth drive from National highway will take you to Udaipur. Your final destination and City of Lakes-Udaipur will be the perfect place to give a tour break. The city seems like a dream world of beautiful lake, palaces and peace around. On arrival check into the hotel in Udaipur. After freshen up in evening proceeds to enjoy boat ride at Lake Pichola. Morning after breakfast proceeds for the guided city tour of Lake city-Udiapur. The tour will start with visit to City Palace which was built by Maharana Udai Singh on the bank Lake Pichola. The palace is so grand and beautiful that it must be visited to feel it’s real charm. After city Palace visit Jagdish Temple , Sahelion-ki-Bari ( Gardens of the maids of Honor ). Later in the evening visit shilpgram craft village. You can get a chance to enjoy and experience the great Rajasthani culture and items made by hand here. You can explore local market and purchase the handicraft and items made of camel leather, puppets etc.